If you ever feel a little numbness, some tingling, or even some weakness in one of your hands, we suggest you go see your doctor and ask to be checked for Carpal Tunnel Syndrome. What Causes The Carpal Tunnel Syndrome? It is important to know that Carpal Tunnel Syndrome is caused by the pressure on the median nerve. This nerve runs the length of the whole arm. It goes through a passage located in the wrist called the Carpal Tunnel, which ends in the hand. The feel of your thumb, its movement and also the movement of all your fingers except for the pink finger are controlled by the median nerve. The carpal tunnel is usually swelled and therefore it narrows. Repetitive movements of the wrist or hands, like typing, this is more common for people who do actions over and over and their hands are most of the time lower than their wrists. There are some conditions that also cause this syndrome like hypothyroidism, sometimes obesity, rheumatoid arthritis, and even diabetes. Another factor that causes Carpal tunnel Syndrome, and that people do not often realize how common it might be, is pregnancy. If you ever get Carpal Tunnel Syndrome, it is very important for you to have it treated. It is very easy to have it treated and if you do not, it can last a very long time, it will get worse and sometimes the pain might go and return. 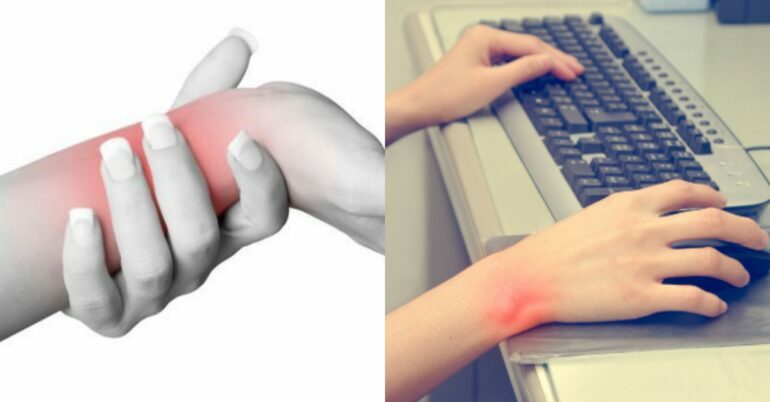 What are the symptoms of the Carpal Tunnel Syndrome? Usually when this syndrome shows up, its first symptoms might be a little numbness, itching, tingling or burning in the palm of your hand or sometimes this factors begin appearing also in your thumb, or your index and middle fingers. As more time passes by, you might begin feeling that part of your hand goes numb or “falls asleep” during the night. It usually happens at night since you normally take a more relaxed position when sleeping. You may wake up with that feeling of numbness the next forming, when it gets worse, there are times when you will feel the numbness up to your shoulder. As it gets more severe it is possible that you begin loosing grip strength in your hand because you muscles usually get smaller. Due to irritation or pressure, your median nerve starts to loose function. Lower impulses on the nerve, loss of feeling in the fingers, loss of strength, coordination and specially ability to use your thumb are some consequences. There are different options that can help you treat your Carpal Tunnel Syndrome. However, it is important to remember that sometimes you might try more than one since different treatments work for different people. Self-Care: Put some Ice on your hand for 10 to 15 minutes every 3 or 4 hours every day. Stretch your hand when feeling numbness for at least 5 minutes. Wrist Brace: It doesn’t work for everybody but you have to make sure to wear it at least for 4 weeks until you begin to see results. There a lot more treatments, like yoga and even surgery. You will now the right one for you once your doctor checks you out.